THE MINERALOGY AND PARAGENESIS OF THE VARISCITE NODULES FROM NEAR FAIRFIELD, UTAH. PART 3. ESPER S. LARSEN, 3d., Harvard University, Cambridge, Mass. TABLE OF CONTENTS. PART 3. A question of prime importance in the origin of the nodules is whether they, were formed from ascending hydrothermal solutions or from ground waters. It is believed that both the variscite and the later phosphates were deposited from ground waters. Pertinent evidence of their origin comes (1) from the minerals found in the nodules and in the surrounding country rock; (2) from the structure of the deposit; (3) from a comparison of the Fairfield deposit with the mineralogy and structure of other variscite deposits; and (4) from a consideration of the origin of similar phosphates in other types of deposits. A mineral assemblage similar to that found at Fairfield is confined almost wholly to similar variscite deposits. Quartz and calcite, variscite, wardite, pseudowavellite, and members of the apatite group are the only minerals found in other deposits of known hydrothermal origin. Quartz and calcite have no significance because of their ubiquitous distribution. Pseudowavellite occurs in hydrothermal iron deposits in Germany (Laubmann, 1922), but in association with wavellite and limonite, and of supergene origin. Variscite has been found in the Marion mine of the Mercur district, five miles north of the Fairfield deposit, but its mode of occurrence is not known; supergene activity has been indicated in this area, and kaolin coats the variscite. Wardite (soumansite) is described by Lacroix (1910) as occurring in the Montebras tin pegmatites; the crystals are planted on the walls of solution cavities in amblygonite, and apparently followed the alteration of a previously formed hydrous sodium aluminum phosphate (morinite); it is not necessarily genetically related to the amblygonite. Members of the apatite group are commonly of hydrothermal origin, but in general these are fluor-apatites or chlorapatites; hydroxyl and carbonate members are abundant in phosphorite deposits. Some of the wardite at Fairfield is divided optically into four biaxial segments; this may be due to inversion from a higher temperature form. It does not revert to this form when heated to near 100° C., but the inversion may be sluggish. It may be a characteristic twinning and not due to inversion. Some of the apatite members show a similar optical segmentation; but apatite members occurring with coal and sedimentary iron ores (Deans, 1938), and in cavities in sedimentary phosphorite nodules show this same optical effect. It is probably a twin-growth phenomenon and not due to an inversion. Both gordonite and variscite permanently lose considerable H2O at 110° C.; they could not have existed in dry rocks without dehydration at temperatures as high as this. These facts suggest little concerning the temperature of formation, but they do not require that the temperature be high. The wall rock material gives only negative hydrothermal evidence. The chert, comprising the bulk of the material in the deposit, may be of hydrothermal origin. Gilluly (1932) describes large tabular masses of chert (jasper) in the Great Blue limestone, some directly associated with metallization and much not visibly so, and attributes them all to a hydrothermal origin; the chert containing the variscite may be related to these bodies. However, they formed at some time previous to the formation of the variscite, as shown by its faulting and brecciation preceding the deposition of variscite. The alunite may be either of hydrothermal or ground-water origin, probably the latter; it likewise must have formed earlier than the variscite, since it was brecciated by the early faulting. The limonite is of doubtless supergene origin, but it formed after the phosphates. There is a notable absence of any typically hydrothermal minerals. Sulfides are lacking; common hydrothermal gangue materials are found only in traces, and most of this not related to the phosphates. Only phosphates were deposited throughout the whole mineralization history of the nodules, with the exception of minor quartz veinlets following the fracturing of the variscite. This mineralization would require a most unusual and unlikely hydrothermal solution, but not an unusual groundwater. The highly shattered nature of the wall-rock and the very open, blocky character of the faulting indicate deformation at very shallow depth, and thus within reach of moving ground-waters. A comparison of the Fairfield deposit with other variscite deposits in Utah and Nevada serves to emphasize some of the features considered above. Little is known in these other occurrences about the phosphate minerals associated with the variscite; pseudowavellite and wardite appear in general to be the principal alteration minerals. Other phosphates may be present but have not been identified. Zalinski (1909) and Sterrett (1909) have described a variscite deposit (Amatrice Hill) located about 25 miles northwest of the Fairfield deposit and nine miles west of Stockton. The variscite occurs as nodules along strong fissures in a crushed and shattered zone which parallels the bedding of upper Carboniferous limestone. The limestone grades upward into a quartzite which is barren of variscite. Variscite, wardite and probably other similar phosphates comprise the nodules, together with a great abundance of chalcedony; much of the variscite is impregnated with chalcedony. Limonite and crushed chert fragments are abundant. Fresh pyrite is found enclosed in variscite. It is believed there have been successive periods of crushing and fracturing with subsequent deposition of various minerals in cracks and seams. The variscite continued to only twelve feet below the surface, and is thus believed to be of local origin. In most features as described by Zalinski and Sterrett this would seem to be identical with the Fairfield deposit. The deposit north of Lucin, Utah, has been described briefly by Pepperberg (1911) and Sterrett (1911). The country rock is a moderately dipping Pennsylvanian (?) quartzite, locally calcareous, with intercalated limestone beds. Tertiary intrusives are nearby. The variscite and associated minerals occur in strongly brecciated quartzite (or more probably a silicified limestone, according to Sterrett), and the mineralization follows the strike intermittently for 600 feet. The angular openings between quartzite breccia fragments have been filled with the phosphates, but they have not replaced the siliceous material. 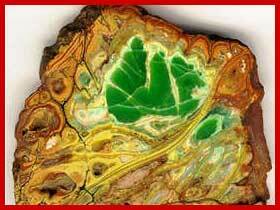 Much of the variscite is in nodules and balls; a small amount forms discontinuous veins. This deposit has yielded crystals of variscite and metavariscite occurring in cavities of the massive variscite (Schaller, 1912). A number of deposits occur in Esmeralda County, Nevada; these have been described by Sterrett (1910, 1911). They occur in a variety of rocks, principally altered rhyolites, but also in altered trachytes, cherty limestone, jasperoid and sandy shale. Where the variscite occurs the rocks are faulted and brecciated, and considerably altered. The variscite occurs as a filling in fissures and joints, replacing other minerals, and as irregular and nodular segregations. The variscite not only fills many seams and joints in the rocks, but the crevices between shattered and brecciated fragments of rocks along the fissures. Some of the larger veinlets can be traced for many feet; the smaller ones are less persistent and vary in direction. The individual seams of variscite vary from paper thickness to 2 or 3 inches in width. Locally they may bulge out into nodular masses several inches across. The different deposits in the same region have no connection with one another, but appear to be of local origin. (Sterrett, 1911, p. 889). Some of the variscite is coated with yellow and black phosphates; the yellow material may be pseudowavellite. In several of these deposits "turquois has been found within a few yards of variscite in similar forms of occurrence" (Sterrett, 1911, p. 889). The conditions surrounding the variscite deposits of Utah are similar in every case so far reported; that is, the mineral is deposited as a cementing material in brecciated limestone, quartzites or igneous rocks. It is usually associated with chalcedony (and chert) and is much younger geologically than the rocks in which it is found. Several of the deposits are found in rocks of the same geological age, but they seem to be strictly local deposits, and, from the evidence at hand, there is no apparent connection between them. Whether there is any relation between the variscite and the rock-phosphate deposits of Idaho, Utah, and Wyoming is not known . . . (p. 233). His remarks apply as well to the Nevada as to the Utah deposits. In none of the deposits is there a suggestion of hydrothermal origin; but there is overwhelming evidence for a purely local origin, a deposition from local solutions, of necessity ground-waters. An innumerable variety of phosphates of calcium and (or) aluminum, generally with water, have been described from deposits of known supergene origin. With the exception of apatite, minerals with compositions similar to these are not derived from solutions of igneous origin. 1. None of the normal hydrothermal minerals are associated with the deposit. 2. The minerals present are hydrates undoubtedly formed at near surface temperatures. 3. Phosphatic ground waters are common in nature. 4. Ground waters commonly form similar phosphate minerals. 5. Phosphatic material is available in the surrounding rocks. 6. The deposit is in a brecciated zone easily accessible to ground waters. The Permian strata (Phosphoria) of Utah and Idaho contain commerical deposits of phosphorite, stratigraphically above the Fairfield ("Great Blue") and Amatrice Hill and Lucin (Weber) rocks. In the region of Fairfield, rock phosphate likewise underlies at some depth the "Great Blue." Non-economic concentrations of phosphate very likely occur locally in intermediate stratigraphic positions. Such evident availability of material for the variscite deposits points to it as the most reasonable source. Pepperberg (1911) has suggested this source. In the Nevada deposits, largely associated with volcanic rocks, the phosphate may be derived from disseminated apatite in the host rocks. A conversion of apatite into phosphates analogous to these is exampled by pseudomorphs of turquois after apatite (Dana, 1892, p. 845). The phosphate to form the turquois of Los Cerillos, New Mexico, is considered by Silliman (in Clarke and Diller, 1886) to be derived possibly from apatite in the enclosing "fine-grained feldspathic rock." Clarke (1920, pp. 515-526; 1921) has collected and summarized the experimental and geological data concerning the geochemistry of phosphates; his publications mainly have been drawn on for the discussion of this section. His references will not be repeated here. Calcium phosphate is freely soluble in carbonated waters, but is precipitated in the presence of excess CaCO3. Thus, phosphorites in limestone exposed to surface waters are concentrated further by selective removal of the calcite forming the limestone. Eventually the phosphorite will itself dissolve in surface waters and migrate downward, probably to be precipitated in underlying limestone as nodular and other forms of phosphorite. When iron or aluminum hydroxides are added to a carbonated water solution of calcium phosphate, the phosphate is precipitated with the iron or aluminum, probably as a basic hydrate. Clarke (1920, p. 516) says: "By reactions of this kind, probably, many well-known minerals have been produced." He includes among minerals probably formed in this way variscite, wavellite, turquois, and wardite, among the phosphates, and the isodimorphous equivalents of variscite, strengite and phosphosiderite. Guano deposits, which contain much phosphate, have afforded good examples of the effect of phosphate solutions on various kinds of rocks. Where the rock underlying guano is limestone, percolating waters have reacted to form principally hydrous calcium phosphates, which may be acid. Where the underlying rock is igneous or contains clay, the reaction normally has developed phosphates of aluminum, with some iron. Analyses of material developed in igneous rocks underlying guano, in several cases approach the composition of variscite. More complex compositions are common, including phosphates with alkalies, magnesia, or ammonia. The common occurrence of turquois in altered volcanic rocks is suggestive of a similar mechanism, the deposition of phosphate by aluminum in the rock. Clarke and Diller (1886) have noted this. The presence of turquois accompanying variscite in some of the Nevada deposits noted by Sterrett (1911, p. 889) suggests that the presence of some copper in the rock may cause the deposition of turquois instead of variscite, other conditions being much the same. The precipitation of aluminum phosphates by the reaction of phosphatic waters on aluminous rocks seems readily to explain the variscite deposits in altered volcanic rocks; some complications seem to arise in applying these ideas to variscite deposits in limestones, as are most of the Utah occurrences. At Fairfield, Kunz (1894) has described the Fairfield variscite as occurring in and below a ferruginous slate; Montgomery (personal communication) questions the existence there of any slate or shale. If such material were there, aluminum would be readily available; however most limestones contain some clay material as impurity in widely varying amounts. The frequent occurrence of variscite along the major fractures in brecciated limestones may have an important bearing on its origin. As noted above, calcium phosphate is readily soluble in carbonated solutions, but is precipitated if the solution stands over solid CaCO3. Normal surface waters would dissolve calcium phosphate from surface phosphorites, and after percolating slowly down into immediately underlying limestone, would reprecipitate the material as calcium phosphate by replacing the calcium carbonate. However, these surface waters containing dissolved calcium phosphate may travel downward rapidly along permeable or even open fracture zones; since the precipitating effect of CaCO3 is slow, steadily moving solutions may lose only a very little of their phosphate when they reach a moderate depth. Thus, at some depth these solutions could meet aluminous material (shales, clay) which would act as a strong precipitant on the dissolved phosphate. It is possible that the alunite present in the Fairfield deposit contributed alumina to precipitate the phosphate; the variscite certainly replaced alunite in small amounts, but alunite is not normally the host of the variscite. It is possible, too, that alunite contributed SO4 to the solutions; this may have some precipitating effect on phosphatic waters. In this way variscite could deposit at depth in a limestone terrain from surface waters. The alteration minerals of the variscite at Fairfield have probably not formed as a result of further introduction of phosphate, but by a later reworking of the phosphate in the variscite. This suggests that the phosphate was introduced throughout some period which ended completely, and perhaps abruptly, with the cessation of phosphatic solutions. Such a limited period of introduction would be expected if a phosphorite bed at the surface contributed the phosphate material; when surface weathering and erosion had removed the phosphorite bed, the source of material would be gone and downward moving solutions would no longer be phosphate-bearing. What the changes in environment were which brought about the altertion of the variscite are not known. Both the variscite and its later alterations probably formed below the water table, since strongly oxidizing conditions appear to have followed all of the phosphate mineralization, as shown by the definitely later introduction of limonite and clay material. Cameron and Hurst (1905, cited by Clarke, 1920) have shown that the reaction in solution between calcium phosphate and aluminum develops an acid medium with the precipitation of a basic phosphate. Since ground waters in a limestone area are alkaline, this reaction in nature may develop either slightly acid solutions or solutions less alkaline than usual. Thus the variscite may have been developed in a nearly neutral environment. With the cessation of introduction of phosphate, the solutions probably became more alkaline; it is under these conditions, perhaps, that the variscite was reacted upon to form the later phosphate minerals. Some evidence for this is shown by the fact that variscite is insoluble in strong acids, but is readily soluble in strong alkalies. There is considerable evidence in the Fairfield nodules that variscite at one time or another was removed by solution as well as by replacement; this suggests alkaline solutions as the dissolving agency. To each of these solutions was added a small amount of powdered variscite and a few small fragments of variscite. All were maintained at, or near, their boiling point for a maximum time of two weeks. Additional water was added at intervals to maintain the original volume. Of the five used, only solutions 3 and 4 (the two stronger NaOH + Ca(OH)2 solutions) showed any effect in two weeks. The NaOH + Ca(OH)2 solutions caused marked effects in less than 48 hours; coarse fragments of variscite were noticeably rounded, and on them was developed a dark gelatinous coating about one-half millimeter in thickness. When dried in the air, the dark shell separated from the variscite and fell into fragments; the remaining variscite core, when broken, showed a thin, hard, white layer completely surrounding it. Under the microscope the dark loose shell was isotropic and nearly opaque, and had an index of refraction around 1.51; the white layer was likewise isotropic and very clouded, and had an index of refraction a little below 1.620. X-ray powder photographs of these two products show only a few faint lines, even after long exposure. Photographs of the two products are identical and their lines match the strong lines of pseudowavellite and deltaite photographs. Thus there is developed an incipient crystallization of a substance related structurally and chemically to the principal alteration mineral in the nodules. This experimental evidence increases the probability that the alterations of variscite were developed from alkaline solutions; but the natural waters were undoubtedly much more dilute and cooler than those used in these experiments. However, given ample time, the same results would be expected from dilute, cool solutions of this same general type. The compositional variations in the solutions which deposited the secondary phosphates are not known. The first period of alteration, producing principally the banded shells, veinlets and spherules of pseudowavellite, wardite and millisite must have seen an increase with time in the quantity of alkalies, especially soda, in the ground waters. Beginning late in the wardite period, solution of the variscite exceeded deposition by replacement to form solution openings, and this dissolution of variscite probably continued after the wardite ceased forming. This suggests that the increased content of alkalies raised the alkalinity of the solutions to a point where their only reaction was to dissolve variscite. The alkalinity apparently decreased to nearly its original state, and the replacement to form the inner bands of pseudowavellite took place. This ended the quantitatively important alteration. The temporary introduction of alkalies into the ground waters may correspond with the surface weathering of a layer of shaly material interbedded with the limestones; in such weathering the soda would be largely freed to the solutions, while most of the potash would be retained in the soil by adsorption (Clarke, 1920, p. 206). The second alteration stage started, apparently, with an excess of magnesia over lime or alkalies, and gordonite was deposited, by replacement of variscite and precipitation as crystals in cavities near variscite. The rest of the stage is largely the formation of minor quantities of calcium aluminum phosphates, the equilibrium conditions of which are not known. The conditions of formation of sterrettite are not known, nor is its sequence closely established. The third stage of alteration represents perhaps a reversion to conditions similar to, but much milder than, the original stage of the alterations, and is represented by the precipitation in cavities of minor amounts of pseudowavellite, and is in only a vague way a reaction of the solutions with the variscite. The final stage of phosphate deposition was characterized by a lack of aluminum and the renewed presence of alkalies, to form apatite members, similar to those found in phosphorites near the surface. Indefinitely later the ground-water level sank below the level of the variscite; limonite and other earthy material came in to, surround the nodules and replace the residual limestone. Phosphorite beds at the surface were attacked by carbonated surface waters, and the resultant solutions of calcium phosphate moved downward along throughgoing channels into the zone below the water table. Here the solutions traversed aluminous material, perhaps shales, and deposited the phosphate as the aluminum salt, variscite. This reaction perhaps caused a decrease in the alkalinity of the solutions. When the phosphorite was completely removed at the surface, the downward-moving ground waters became free of phosphate material, and returned to their usual alkaline state. This return to stronger alkalinity caused a reaction with the variscite to replace it with calcium aluminum phosphate (pseudowavellite), an introduction of only calcium. Soda then became an important constituent of the solutions, perhaps derived from the weathering of shales or shaly limestones exposed at the surface; this resulted in the deposition of millisite and wardite. The soda increased the alkalinity of the solutions, eventually to the point where the deposition of wardite did not keep pace with the removal of variscite by solution. The solutions then returned to their normal alkalinity, probably with the removal of the shale and the exposure again of limestones, and again deposited pseudowavellite in place of the variscite. This ended the bulk of the mineralization. The stages following this are represented in the nodules primarily by rare crystals in the solution cavities, at first aluminum phosphates of magnesium (gordonite), followed by calcium. In the final stage aluminum is absent, and alkalies reappear. The equilibrium conditions controlling the deposition of these is not known, so that the state of the solutions forming them cannot be surmised. With the lowering of the water table below the variscite, oxidizing conditions ensued, with the deposition of abundant limonite. It is believed that one of the major factors permitting the deposition of variscite at Fairfield, and probably some other deposits, was the existence of open fissures which permitted the surface solutions containing dissolved calcium phosphate to move rapidly downward through underlying limestone into rocks containing aluminum. In the normal course, ground waters with dissolved calcium phosphate seep down into underlying limestones, where the phosphate is leisurely precipitated by the excess of calcium carbonate. Where open channels allow more rapid descent of the solutions, the precipitating effect of the limestone is not so effective, and phosphate-bearing solutions can thus reach aluminous rocks, and the aluminum will act as the precipitant. The equilibrium conditions which determined the deposition of variscite rather than some other aluminum phosphate (such as wavellite) are not known. CLARKE, F. W., and DILLER, J. S., Turquois from New Mexico: Am. Jour. Sci., 32, 211-217 (1886). CLARKE, F. W., The Data of Geochemistry, 4th Edition, Bull. 695, U. S. Geol. Surv. (1920). CLARKE, F. W., The Data of Geochemistry, 5th Edition, Bull. 770, U. S. Geol. Surv. (1924). DANA, E. S., A System of Mineralogy, 6th Edition, John Wiley and Sons, Inc., New York (1892). DEANS, T., Francolite from sedimentary ironstones of the Coal Measures: Mineral. Mag., 25, 135-139 (1938). DENNISON, J. M., Wardite, a new basic phosphate of alumina: Am. Jour. Sci., (IV), 2, 154 (1896). GILLULY, J., Geology and ore deposits of the Stockton and Fairfield Quadrangles, Utah: Prof. Paper 173, U. S. Geol. Surv. (1932). HINTZE, C., Handbuch der Mineralogie, nos. 47--50, 745--1454 (1931-1933). KUNZ, G. F., 16th Annual Report, pt. IV, U. S. Geol. Surv. (1895). LACROIX, A., Mineralogi.de la France, 4, 541-542 (1910). LARSEN, E. S., and SCHALLER, W. T., The identity of variscite and peganite and the dimorphous form, metavariscite: Am. Mineral., 10, 23-28 (1925). LARSEN, E. S., and SHANNON, E. V., (1930a), Two phosphates from Dehrn; dehrnite and crandallite: Am. Mineral., 15, 303-306 (1930). LARSEN, E. S., and SHANNON, E. V. (1930b), The minerals of the phosphate nodules from near Fairfield, Utah: Am. Mineral., 15, 307-337 (1930). LARSEN, E. S., 3d, Overite, a new mineral from Fairfield, Utah (Abstract): Am. Mineral. 23, no. 12, pt. 2, p. 9 (1938). LARSEN, E. S. 3d, Overite and rnontgomeryite: two new minerals from Fairfield, Utah: Am. Mineral., 25, 315-326 (1940). LARSEN, E. S. ed, and MONTGOMERY, A., Sterrettite, a new mineral from Fairfield Utah: Am. Mineral., 25, 513-518 (1940). LAUBMANN, H., Die Phosphat-Mineralien and Edelerden des Amberg-Auerbacher Erzkörpers: Geogn. Jahres, 35, 202203 (1922). MCCONNELL, D., Structural investigation of the isomorphism of the apatite group: Am. Mineral., 23, 1-19, 606 (1938). MCCONNELL, D., The symmetry of phosphosiderite (Abstract): Am. Mineral., 24,189 (1939). MCCONNELL, D. Clinobarrandite and the isodimorphous series, variscite-metavariscite: Am. Mineral., 25, 719-725 (1940). MOSCHETTI, L., Sulla probabile identita della peganite con la variscite: Reale Accademia delle Scienze di Torino, 53 (1918). PACKARD, R. I., Variscite from Utah: Am. Jour. Sci., (III), 47, 297 (1894). PEPPERBERG, L. J., Variscite near Lucin, Utah: Min. and Sci. Press, Aug. 19, 233-234 (1911). POUGH, F. H. (1937a), The morphology of wardite: Am. Mus. Nov., no.. 932, 1-5 (1937). POUGH, F. H. (1937b). The morphology of gordonite: Am. Mineral., 22, 625-629 (1937). SCHALLER, W. T. (1912x), Crystallized variscite from Utah: Bull. 509, U. S. Geol. Surv., 48-65 (1912). SCHALLER, W. T. (1912), Crystallized variscite from Utah: Proc. U. S. Nat. Mus., 41, no. 1867, 413-430 (1912). SCHALLER, W. T., Lucinite, a new mineral: a dimorphous form of variscite; the crystallography of variscite: Bull. 610, U. S. Geol. Surv., 56-80 (1916). STERRETT, D. B., Mineral Resources of the United Slates for 1904, Part 2: U. S. Geol. Surv. (1905). STERRETT, D. B., Mineral Resources of the United Slates for 1905, Part 2: U. S. Geol. Surv. (1906). STERRETT, D. B., Mineral Resources of the United States for 1906, Part 2: U. S. Geol. Surv. (1907). STERRETT, D. B., Mineral Resources of the United States for 1907, Part 2: U. S. Geol. Surv. (1908). STERRETT, D. B., Mineral Resources of the United States for 1908, Part 2: U. S. Geol. Surv. (1909). STERRETT, D. B., Mineral Resources of the United States for 1909, Part 2: U. S. Geol. Surv. (1910). STERRETT, D. B., Mineral Resources of the United Slates for 1910, Part 2: U. S. Geological Survey (1911). STRUNZ, H., Isotypie zwischen Skorodit and Norbergit: Zeits. Krist., 99, 513-514 (1938). STRUNZ, H., and SCHROETER, J., Plan einer Klassifikation der natilrlichen Phosphate, Arsenate and Vanadate: Zeits. Krist., 102, 71-78 (1939). STRUNZ, H., and SZTR6KAY, K., Isodimorphie zwischen Metavariscit, Variscit, Phosphosiderit and Strengit: Zent. Min., pt. A, no. 9, 272-278 (1939). ZALINSKI, E. R., Amatrice, a new gem stone of Utah: Eng. Min. Jour., 87, 1038-1039 (1909). Variscite from the Clay Canyon deposit near Fairfield, Utah was first identified in 1893. Its compact, microcrystalline nature and pleasing color in various shades of green led to early recognition of its use as a semi-precious gemstone. Mining and marketing of the variscite as "chlor-utahlite" on a small scale for the jewelry trade continue up to about the time of the World War 1. Associated with the variscite in nodular masses was a compact banded yellow material that soon found a market as "sabalite" though it was not nearly as popular as variscite. Some of the nodules are sufficiently altered that open pockets have developed. Occasionally crystals of a blue green mineral are to be found and these turned out to be a new mineral which was named "wardite" (Packard, 1896). Strangely, thirty-four years were to pass before another mineralogical paper concerning the unusual phosphate minerals of this deposit was to appear. Eight new minerals were then described and, ten years later, three additional new minerals were named. Subsequently, re-examination of these eleven new minerals led to five being discredited and an additional one was found to have been already described under another name. The remaining five have stood the test of re-examination and appear to be safely established. This is not to say that further work will not add to the sum of knowledge about these five and, perhaps, disclose the presence of additional new minerals. Variscite from the Clay Canyon deposit was first brought to the attention of the scientific world in December, 1893 by Mr. F. T. Millis of Lehi, Utah, who sent a specimen to Mr. Merrill, Curator of Geology in the U.S. National Museum (Smithsonian Institution). Mr. Millis related that the material occurred in the form of "nuggets" in a quartz vein near Lewiston (now Mercur), Utah, some twenty miles west of Lehi (Figure 1). This specimen was subjected to blowpipe examination, a useful technique which has unfortunately fallen into disuse, and found it to have the characteristics of "peganite". A chemical analysis of the specimen showed that its composition was the same as variscite and "peganite" has subsequently been considered to be a poorly analyzed variscite (Packard, 1894). At about the same time or slightly later, Mr. Don McGuire of Ogden, Utah discovered compact nodular variscite in Cedar Valley, near old Camp Floyd (first name for Mercur mining district), Utah (Kunz, 1894). This is certainly the same locality as that from which Mr. Millis obtained his material. Unfortunately, there is no record of the relationship of Millis and McGuire and we can only surmise who actually found the locality first. However, Don McGuire acquired the deposit and produced variscite for the jewelry trade from it for many years (Sterrett, 1908, 1914). Kunz suggested the name "utahlite" for the material and this name was shortly amended to "chlor-utahlite" Sterrett, 1909) in apparent reference to the materialÕs green color and, possibly to more easily promote the material to the jewelry trade. The specimen examined by Merrill and Packard at the National Museum was described as a large nodular mass, measuring nearly seven inches in its longest dimension. Green variscie in sections were separated from each other by banded envelopes of a yellow mineral, crandallite between which and the green is a powdery white coating (Packard, 1894). Subsequently, John M. Davison wrote that a considerable quantity of variscite had been received by WardÕs Natural Science Establishment of Rochester, New York. In the variscite nodules he found cavities left by the decomposition of the variscite. These were encrusted with light green to bluish green crystals of a new phosphate mineral, which he named wardite after Professor Henry A. Ward (Davison, 1896). Mineralogical examination of the variscite nodules and the various alteration minerals then ceased for 27 years when in 1923, Esper S. Larsen of Harvard University and Earl V. Shannon of the U. S. National Museum undertook an intensive study of the variscite nodules utilizing material in the collection of their respective institutions and a large collection loaned to them by George L. English at WardÕs Natural Science Establishment. In the summer of 1927, Larsen visited the locality and collected a few specimens from the dump. A brief review of some of the characteristics of each mineral will be given in the approximate order in which they are believed to have formed in the deposit. Variscite This mineral, a hydrous aluminum phosphate, occurs in dense microcrystalline nodular masses; No crystals have been found at this location. The beautiful green color has been attributed to small quantities of vanadium (0.53%) and chromium (0.069%) substituting for phosphorus (Foster and Schaller, 1966). Significant amounts of scandium, 0.001-0.1%, have been found (Frondel, Ito and Montgomery, 1968). All other phosphates in the deposit are believed to have formed at the expense of variscite through the action of hydrothermal solutions. Crandallite The first mineral to form from variscite through the addition of calcium, this yellow to light olive green species occurs in a variety of massive and crystal habits. The most abundant forms of this mineral cover the entire spectrum from massive, cherty material through yellowish and pinkish spherulitic cleavages to white, chalky crusts. When crystallized, this mineral varies from feathery clusters of fibrous needles through more substantial, but tiny prismatic crystals to distinct flattened rhombs with an equally developed base. The Clay Canyon material was first called pseudowavellite, however, the name crandallite had priority (Palache, Berman and Frondel, 1957). This mineral in its various modes has been shown to contain significant amounts of vanadium, 0.37%, and chromium 0.67% (Foster and Schaller, 1966); strontium, >1.0% (Foster and Schaller, 1966); and scandium, 0.01-0.80% (Frondel, Ito and Montgomery, 1968). The first two elements certainly are responsible for the color. Wardite The blue green to bluish grey component of the "eyes" or spherules and veining within variscite, this species also occurs in blue green to yellow crystals lining cavities in the more altered nodules (Packard, 1896; Montgomery, 1970a). (photograph and single crystal drawing) The blue green variety owes its color, no doubt, to minor amounts of vanadium and or chromium substituting for phosphorus as in the case of variscite. Solutions altering the variscite now have become enriched in sodium. Concentric accretion of wardite and millisite. Millisite White to clear component along with wardite of the spherules and veining noted above. No isolated crystals have been found of this species, which is similar in composition to wardite but containing calcium. Gordonite This mineral occurs within open cavities generally near altering variscite as clusters of brilliant prismatic crystals. Crystals up to 7 mm have been reported, but they usually are in the millimeter range (Montgomery, 1970b). (photograph and single crystal drawing) Gordonite is usually colorless, but can be faintly yellow or a pleasing shade of pale violet. Here again we possibly are seeing the effects of one of the chromophores, vanadium and (or) chromium. Gordonite is the first species to appear in the deposition sequence containing magnesium and may be forming at the expense of crandallite. Bannister, F. A. (1941) The identity of "eggonite"with sterrettite, Mineralogical Magazine, Volume 26, pages131-133. Blount, Alice M. (1974) The crystal structure of crandallite, American Mineralogist, Volume 59, pages 41 to 47. Davison, John M. (1896) Wardite: a new hydrous basic phosphate of alumina, American Journal of Science, Fourth Series, Volume 2, pages 154 to 155. Dunn, Pete J. (1978) Dehrnite and lewistonite: discredited, Mineralogical Magazine, Volume 42, pages 282 to 284. Dunn, Pete J. (1980) Carbonate-fluorapatite from near Fairfield, Utah, Mineralogical Record, Volume 11, pages 33 to 34. Dunn, Pete J. and Rouse, Roland C. and Nelen, Joseph A. (1984) Englishite: new chemical data and a second occurrence, from the Tip Top Pegmatite, Custer, South Dakota, Canadian Mineralogist, Volume 22, pages 469 to 470. Dunn, Pete J. and Francis, Carl A. (1986) Davisonite and lehiite discredited, American Mineralogist, Volume 71, pages 1515 to 1516. Elberty, W. T. and Greenberg, S. S. (1960) Deltaite is crandallite plus hydroxylapatite, Geological Society of America Bulletin, Volume 71, page 1857 (abstract). Fleischer, Michael and Mandarino, Joseph (1991) Glossary of Mineral Species, Seventh Edition, Mineralogical Record, Tucson, Arizona. Foster, Margaret D. and Schaller, Waldemar T. (1966) Cause of colors in wavellite from Dug Hill, Arkansas, American Mineralogist, Volume 51, pages 422 - 429. Frondel, Clifford and Ito, Jun and Montgomery, Arthur (1968) Scandium content of some aluminum phosphates, American Mineralogist, Volume 53, pages 1223-1231. Gilluly, James (1932) Geology and ore deposits of the Stockton and Fairfield Quadrangles, Utah, Professional Paper 173, U.S. Geological Survey, Washington, D.C.; 171 pages. Hamilton, Howard V. (1959) Variscite and associated minerals of Clay Canyon, Utah, Mineralogical Society of Utah Bulletin, Volume 9, Number 1, pages 13-17. Hey, Max H. and Milton, Charles and Dwornik, E.J. (1982) Eggonite (Kolbeckite, Sterrettite), ScPO4.2H20, Mineralogical Magazine, Volume 45, pages 493-497. Jewell, Paul W. and Parry, W.T. (1987) Geology and hydrothermal alteration of the Mercur Gold Deposit, Utah, Economic Geology, Volume 82, pages 1958-1966. Kunz, George F. (1984) Utahlite, U.S. Geological Survey 16th Annual Report, Part IV, page 602. Larsen, Esper S. and Shannon, Earl V. (1930a) The minerals of the phosphate nodules from near Fairfield, Utah, American Mineralogist, Volume 15, pages 307-337. Larsen, Esper S. and Shannon, Earl V. (1930b) Two Phosphates from Dehrn; Dehrnite and Crandallite, American Mineralogist, Volume 15, pages 303-306. Larsen, Esper S., III (1940) Overite and Montgomeryite: Two new minerals from Fairfield, Utah, American Mineralogist, Volume 25, pages 315-326. Larsen, Esper S., III (1942a) The mineralogy and paragenesis of the variscite nodules from near Fairfield, Utah, part 1, American Mineralogist, Volume 27, pages 281-300. Larsen, Esper S., III (1942b) The mineralogy and paragenesis of the variscite nodules from near Fairfield, Utah, part 2, American Mineralogist, Volume 27, pages 350-372. Larsen, Esper S., III (1942c) The mineralogy and paragenesis of the variscite nodules from near Fairfield, Utah, part 3, American Mineralogist, Volume 27, pages 441-451. Larsen, Esper S., and Montgomery, Arthur (1940) Sterrettite, a new mineral from Fairfield, Utah, American Mineralogist, Volume 25, pages 513-518. McConnell, Duncan (1938) A structural investigation of the isomorphism of the apatite group, American Mineralogist, Volume 23, pages 1-19. Modreski, Peter J. (1976) Little Green Monster Variscite mine, Mineralogical Record, Volume 7, pages 269-270. Montgomery, Arthur, (1970a) the phosphate minerals of Fairfield, Utah, Rocks and Minerals, Volume 45, Number 11, pages 667-674. Montgomery, Arthur, (1970b) The phosphate minerals of Fairfield, Utah, part 2, Rocks and Minerals, Volume 45, Number 12, pages 739-745. Montgomery, Arthur, (1971a) The phosphate minerals of Fairfield, Utah, part 3, Rocks and Minerals, Volume 46, Number 1, pages 3-9. Montgomery, Arthur, (1971b) The phosphate minerals of Fairfield, Utah, part 4, Rocks and Minerals, Volume 46, Number 2, pages 75-80. Moore, Paul B. (1976) Derivative structures based on the alunite octahedral sheet: mitridatite and englishite, Mineralogical Magazine, Volume 40, pages 863-866. Mrose, Mary E. and Wapner, Blanca (1959) New data on the hydrated scandium phosphate minerals: sterrettite, "eggonite", and kolbeckite, Geological Society of America Bulletin, volume 70, pages 1648-1649 (abstract). Nickel, Ernest H. and Monte C. Nichols (1991) Minerals reference manual, Van Nostrand Reinhold, New York, 250 pages. Packard, R.L. (1894) Variscite from Utah, American Journal of Science, Third Series, Volume 47, pages 297-298. Palache, Charles and Harry Berman and Clifford Frondel (1951) The system of mineralogy, Seventh Edition, Volume II, New York. Pough, Frederick H. (1937a) The morphology of wardite, American Museum Novitates, Number 932, 5 pages. Pough, Frederick H. (1937b) The morphology of gordonite, American Mineralogist, Volume 22, pages 625-629. Sinkankas, John (1959) Gemstones of North America in two volumes, Volume I, Van Nostrand Reinhold, New York, 675 pages. Sterrett, Donald B. (1908) Variscite, Mineral resources of the United States for 1907, Part II Nonmetallic Products, U.S. Geological Survey, pages 853-856. Sterrett Donald B. (1909) Variscite, mineral resources of the United States for 1908, Part II Nonmetallic Products, U.S Geological Survey, pages 795-801. Sterrett, Donald B. (1910) Variscite, Mineral resources of the United States for 1909, Part II Nonmetallic Products, U.S. geological Survey, Pages 888-897. Sterrett, Donald B. (1911) Variscite, Mineral resources of the United States for 1910, Part II Nonmetallic Products, U.S. Geological Survey, pages 1073-1074. Sterrett, Donald B. (1912) Variscite, Mineral resources of the United States for 1911, Part II Nonmetallic Products, U.S. Geological Survey, Pages 1056-1057. Sterrett, Donald B. (1914) Variscite, Mineral resources of the United States for 1913, Part II Nonmetallic Products, U.S. Geological Survey, page 334.